Start the Request for Proposal process. Questions? Call us at 1-800-667-6389. Fill out the form to download the Request For Proposal questionnaire and the Guide to RFP Success, and start building a comprehensive proposal. These resources include best practices, and they can help identify the most important questions to ask about digital marketing technology and services. and Guide to RFP Success. 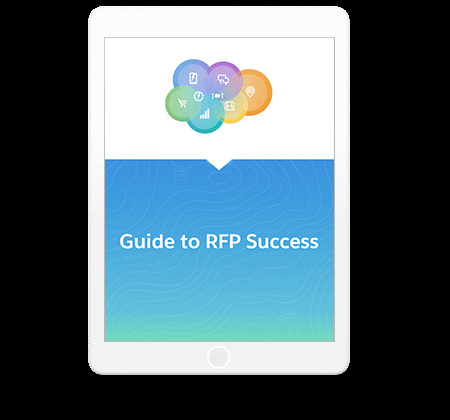 Get the RFP questionnaire and Guide to RFP Success. Please fill out all fields. Please fill out the highlighted fields below. Yes, I would like to receive marketing communications regarding Salesforce products, services, and events. I can unsubscribe at any time. I agree to the Privacy Statement. In particular, I consent to the transfer of my personal information to other countries, including the United States, for the purpose of hosting and processing the information as set forth in the Privacy Statement. I understand that these countries may not have the same data protection laws as the country from which I provide my personal information. For more information, click here. By registering, you confirm that you agree to the processing of your personal data by Salesforce as described in the Privacy Statement. By registering, you confirm that you agree to the processing of your personal data by Salesforce as described in the Privacy Statement. By registering, you confirm that you agree to the Event Terms of Service and to the storing and processing of your personal data by Salesforce as described in the Privacy Statement. By registering, you confirm that you have read and agree to the Event Terms of Service, and that you agree to the processing of your personal data by Salesforce as described in the Privacy Statement. * By submitting this form, you are confirming you have read and agree to our Terms and Privacy Statement. © Copyright 2000–2018 salesforce.com, inc. All rights reserved. Various trademarks held by their respective owners.